For decades, advertisers have been quick to target moms as they have been typically known to make most of the buying decisions in households. There are plenty of stats about how moms make these buying decisions along with the channels and devices they use, but what about the other decision making parent? We’re talking Dads. Dadvertising. ‘The rise of the alpha dad’ Times Magazine called it in their recent piece on the rise of stay-at-home-dads. Huffington Post also recently featured this rising trend giving an estimate of 1.9 million stay-at-home dads reported last year. While it remains true that millennials continue to dominate mobile, the IAB study found that Generation Xers–guys between 35 and 54 years old–make up 51% of the on-the-go dad audiences. Also, 57% of the dad audiences’ online time is spent on mobile–a growing number and close behind moms who have been reported to spend roughly 71% of their online time on mobile. Spending power is a major reason why mobile dads are proving to be an important demographic segment. Scanning the Internet and making purchases in today’s mobile world is easy and it’s fast and here is an audience with rising numbers in taking advantage of mobile. Besides stay-at-home-dads, Adweek is calling the mobile audience a “lucrative opportunity” for marketers as 58% of mobile dads are making more than $75k a year, with three in four mobile dads working full time, said IAB’s report–with a growing number of them shopping straight from their mobile devices. What about social? Similar to moms and millennials, dads are using mobile devices for social media found IAB (their number one category for tablets). More specifically, dads are using mobile for news, but surprisingly also for sharing photos, shopping apps, and accessing maps more often than mobile moms–perhaps potentially perfect ad spaces for family-oriented campaigns. 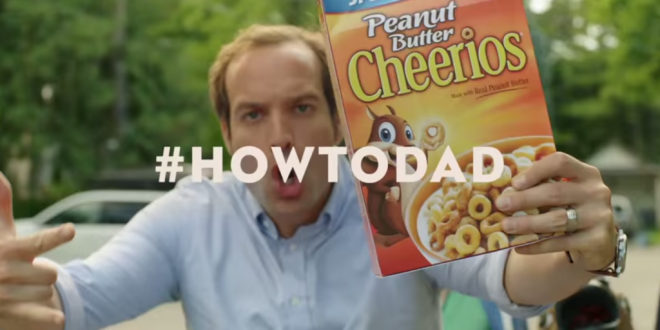 We’ve already seen several big brands embrace “dad”-vertising this year. The Super Bowl this past February especially welcomed the idea of 2015 being “The Year of the Dad.” We’re seeing ads celebrate fatherhood and tug at the heartstrings of emotionally engaged dads. One of our favorites is Dove’s dad ad, which proclaims that a man is made stronger by showing that he cares, accompanied by the hashtag #realstrength seen below. We’re prepared to see an outburst of Father’s Day material from brands around the 21st, but climbing numbers are pointing to a marketing opportunity beyond Father’s Day. For marketers, this growing mobile audience should help ensure that family-oriented marketing campaigns reach not only moms, but father figures as well. What’s your take on dad-vertising? Let us know on our Facebook page. ‹ How Do You Like Them Apple Boxes?